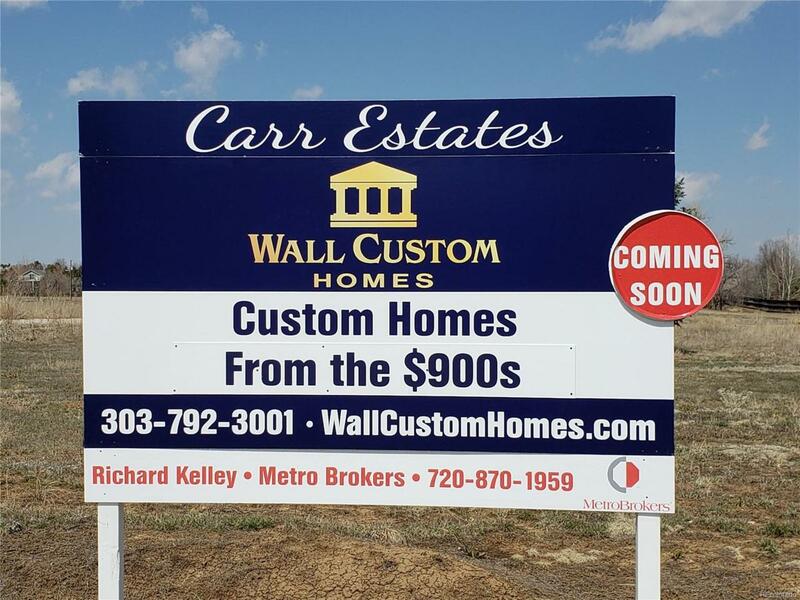 NEW CUSTOM HOME SUBDIVISION - "CARR ESTATES". FABULOUS LOCATION ON THE NORTH SIDE OF WEST 144TH AVE. JUST WEST OF HURON AND NORTH ACROSS 144TH FROM HUNTINGTON TRAILS. QUICK ACCESS TO I25. FIRST PHASE OF LOTS TO BE READY FOR DELIVERY LATE SPRING OF 2019. DEVELOPMENT WILL BE A TOTAL OF 33 LOTS . DEVELOPMENT INCLUDES A PRIVATE PARK AS WELL AS A LARGE PUBLIC PARK AT THE REAR OF PROJECT. PRICES OF FIRST PHASE LOTS RANGE FROM $174,600 TO $212,500. HIGHLY DESIRABLE ADAMS 12 5 STAR SCHOOLS. HOMES TO BE BUILT BY MULTIPLE AWARD WINNING WALL CUSTOM HOMES (WALLCUSTOMHOMES.COM). FINISHED HOMES WILL BE IN THE RANGE OF $900,000 PLUS, INCLUDING THE LOT. DESIGN YOUR OWN DREAM HOME. NO REQUIRED PLANS. CURRENTLY TAKING FULLY REFUNDABLE LOT RESERVATIONS. CONTACT LISTING BROKER FOR SUBDIVISION PLAT MAP AND OTHER INFORMATION. Offered by Mb Provident Real Estate.